The brown carapace, or top part of the shell, is highly domed and flattened dorsally with prominent growth lines. The plastron, or bottom part of the shell, is yellowish. Thick, scaly limbs, the tail, and the head can be pulled inside the shell. The hind limbs are elephant-like and the forelimbs are shovel-like for digging. Males are larger and have longer gular shields, or projections of the plastron extending below the throat, and larger chin glands than females. The plastrons of males are concave as opposed to flat in females. Juveniles are smaller and lighter in color than adults. Desert tortoises are long-lived, reaching 80 years or more, although 30 to 45 years is more common for adults. Only about 2 percent of hatchlings reach adulthood. Sexual maturity is reached at approximately 15 years of age. 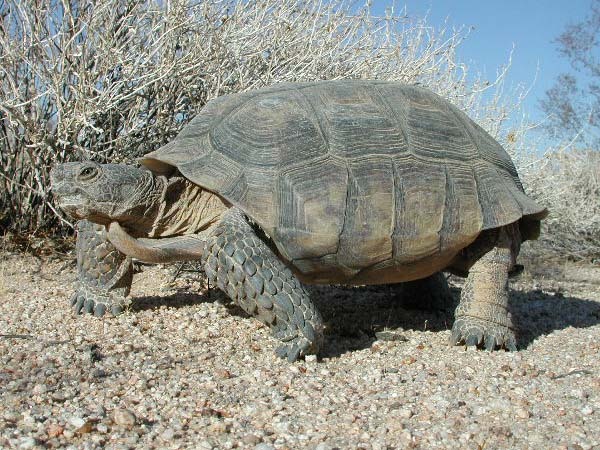 Desert tortoises are found in desert shrubland habitat in the Mojave Desert at about 1000 to 4000 feet in elevation. The range extends from the southwestern United States, ( Nevada, California, Arizona, Utah, and New Mexico) south to Mexico. Desert tortoises dig burrows in the ground in which they spend the major portion of their lives. A shallower, summer burrow is constructed as an escape from heat. They hibernate in their deeper (up to 30 feet), winter burrows. Winter burrows are often communal. Desert tortoises may use multiple burrows in the summer, while the winter burrow is usually used year after year. The desert tortoise is diurnal and can be seen out of its burrow most often in the mornings. The tortoises are able to store water in their bladder for months at a time without voiding and their waterproof skin and shell reduce evaporation. Also, they can switch from excreting urea, which contains a lot of water, to excretion of uric acid crystals when necessary. The desert tortoise is an herbivore. Its diet includes grasses, cacti, and forbs as well as some insects, caterpillars, and insect larvae. Most of the desert tortoises’ water is obtained from the vegetation they eat since water is rarely available to drink. During the breeding season, males bob their heads and ram each other to establish dominance and compete for females. Females lay a clutch of up to 15 eggs (usually 4 to 12) in May to July and 0 to 3 clutches may be laid per year. The eggs are laid in a shallow hole near the entrance to the burrow. Hatchlings emerge in the late summer or fall. The shells of hatchlings are leathery and may take 5 years or more to fully harden, making them vulnerable to predators..
Desert tortoises are currently listed as a Threatened species under the Endangered Species Act. In Nevada, they are classified as a State Protected and Threatened species. Numbers of desert tortoises in the wild are declining due to habitat loss, fragmentation, and degradation. The spread of easily transmitted diseases, road kills, and illegal collection from wild populations further contribute to the range-wide declines. High levels of predation on juveniles as well as their slow maturation rate make it difficult for populations to recover. Habitat protection is crucial for the recovery and continued existence of the desert tortoise. Large tracts of undisturbed, undeveloped land have been protected for the benefit of desert tortoises. Numerous federal, state, and local agencies are working cooperatively to protect the desert tortoise, and extensive research is being conducted in the areas of tortoise diseases and biology. Desert tortoise populations are continuously monitored in Nevada. The desert tortoise is the Nevada state reptile. The temperature at which desert tortoise eggs are incubated determines whether the hatchling will be male or female. At lower temperatures most hatchlings will be male, while at higher temperatures most hatchlings will be female. Desert tortoises have existed on earth for millions of years. The desert tortoise is the largest reptile living in the Mojave Desert.